Lock in a great price for Heure Bleue Palais - Relais & Châteaux – rated 8.9 by recent guests! What a treat! Everything was perfect - staff made our stay a real pleasure and for our one night in Essouiara this hotel was perfectly located. We had dessert and breakfast at the restaurant - food was excellent - no doubt dinner would have been lovely also. An issue with my room was taken care of quickly by management when I emailed the hotel manager. Good Location, great service and friendliness of the staff. The hotel is beautiful from top to bottom. The staff was professional but warm and welcoming. 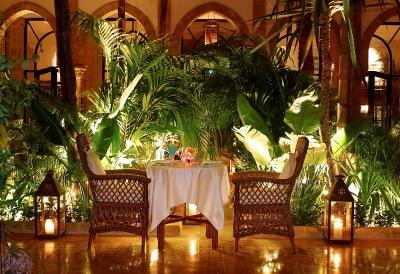 The restaurant had atmosphere and the food was excellent with special kudos to the breakfast. 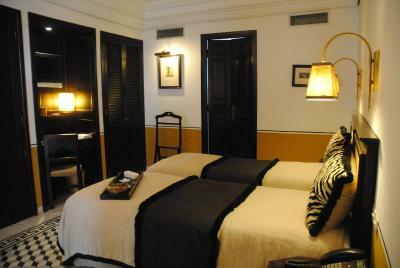 Great location, beautiful old palace, very elegant and beautiful accommodations. 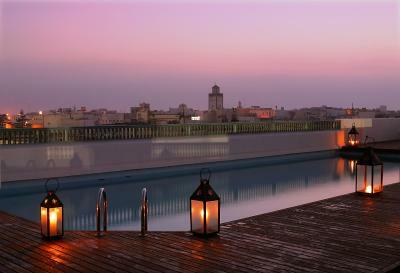 Rooftop pool with view of the Medina. Needs to be refreshed. Very central location in the Medina. Great breakfast. 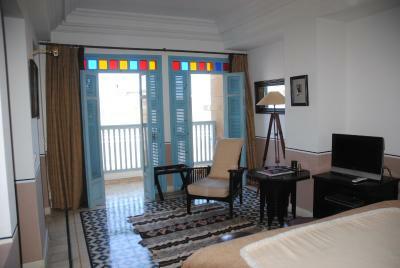 Very charming riad in a very good location inside the old city. The service is excellent. Loved the bar and swimming pool in the rooftop. 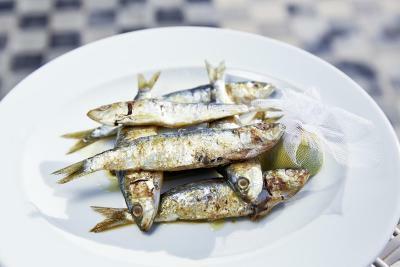 We had a wonderful time in the restaurant and the chef appetizers were fantastic! Loved the wine specially tailored for the heure bleu. Loved also the cinema room and the fact that you can sit there with a blanket and play a movie of your choice ! Well! This hotel is an experience!!! The room was spacious and nicely decorated. 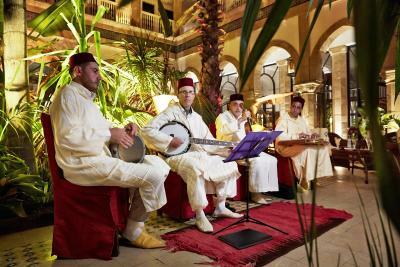 The hotel is ideally located, at the entrance of the old town. We really appreciated the kindness and politeness of the staff. They were always smily and helpful. Lovely stay and so relaxing. 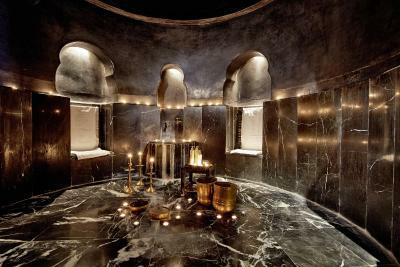 Fab Hammam and timeless property. Best hotel slippers ever. Touched by the kindness of the property manager and the staff at large. Loved the parting gift of water and Moroccan pastries. 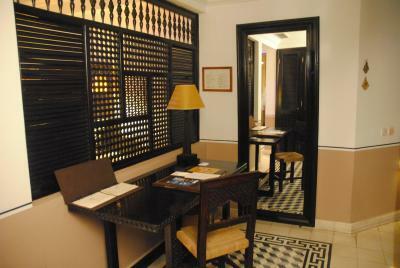 The staff were friendly and accommodating and gave excellent recommendations on where to go while staying in the city. 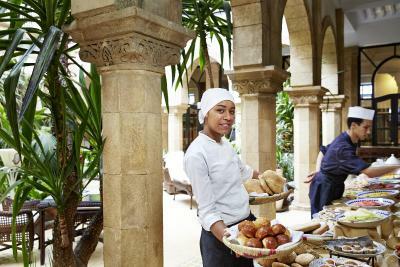 Breakfast was fabulous and served in the beautiful courtyard. The air conditioning did not work in our room so we were moved to another room where it still didn't work. The staff came to repair it and told us it was working but the room did not get cool. Nothing was done to compensate us for our inconvenience and discomfort. Heure Bleue Palais - Relais & Châteaux This rating is a reflection of how the property compares to the industry standard when it comes to price, facilities and services available. It's based on a self-evaluation by the property. Use this rating to help choose your stay! 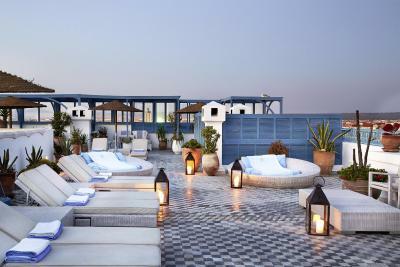 One of our top picks in Essaouira.This luxurious hotel features a terrace with a heated outdoor pool with panoramic views of the Medina and the sea. 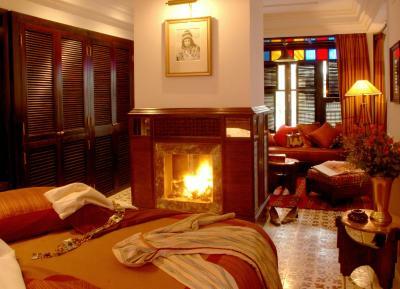 It is just 1,300 feet from the beach, in central Essaouira. 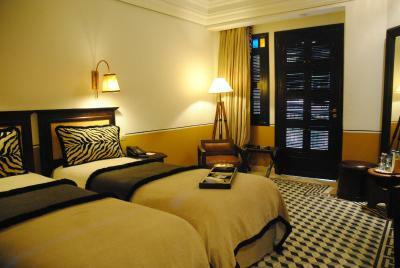 The Heure Bleue Palais offers spacious rooms and suites with an elegant décor. 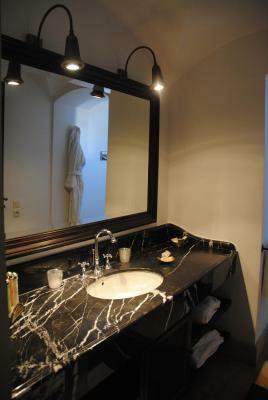 They come with flat-screen TVs and marble bathrooms, and some also feature Italian showers or balconies. 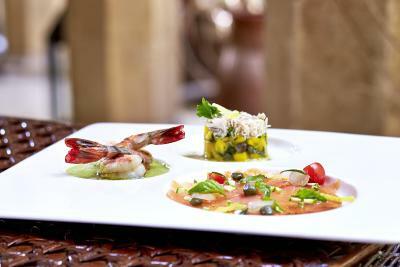 At the Bleue Palais, guests can choose from several dining options. 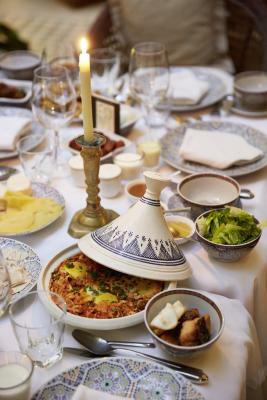 The outdoor restaurant, Courtyard Patio, serves both international and Moroccan cuisine, and the Moroccan Restaurant serves gourmet cuisine. 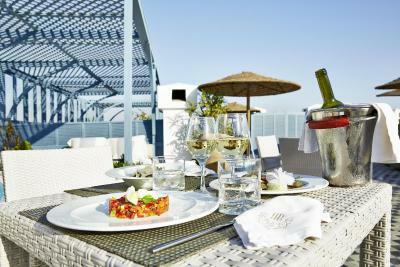 Light lunches can also be enjoyed on the panoramic terrace. 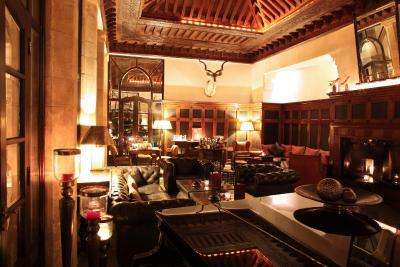 The hotel’s cozy bar, the English Lounge, features a piano and a fireplace. 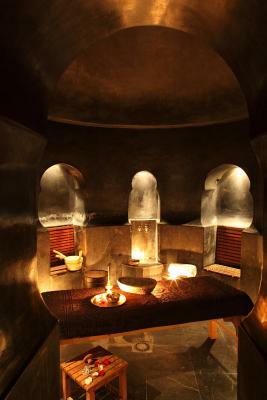 There is also a cinema room, a hammam and a massage room. 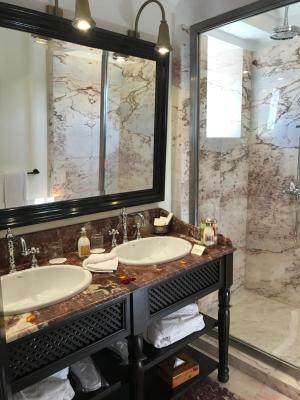 Faclities include free Wi-Fi access, room service and an on-site currency exchange. 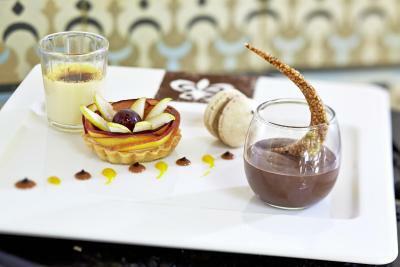 When would you like to stay at Heure Bleue Palais - Relais & Châteaux? 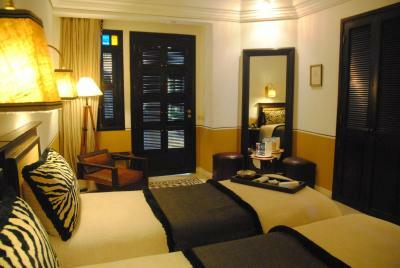 Classic double rooms are located on the first floor of the hotel in the central patio. 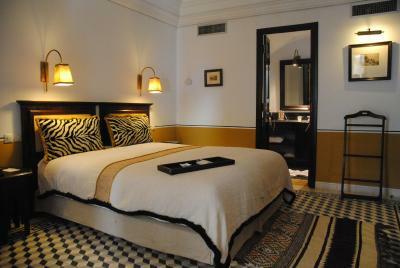 They are decorated in an African colonial atmosphere and have a king size bed and a bathroom with shower and toilet. The equipment is complete with dressing room, satellite TV and desk. 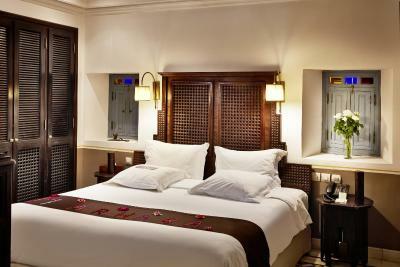 Deluxe double rooms are located on the first, second and third floors of the hotel and are accessible from the patio plant. They are decorated in a warm African or East English as bedrooms have two single beds of 35 in, a bathroom and separate toilet. 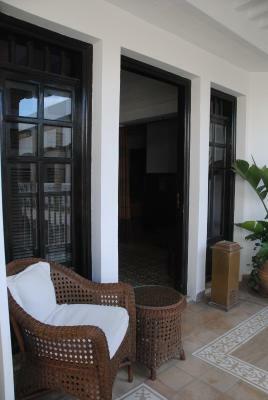 They have a desk and a seating area and some large doors and a balcony overlooking the medina. The equipment is complete with wardrobe, satellite TV, safe and mini-bar. 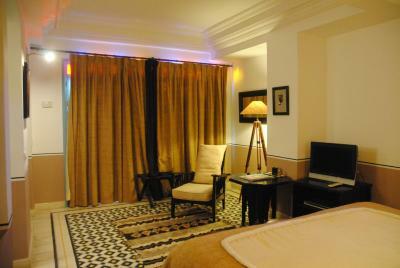 Located in the second floor, this very spacious suite features a desk. 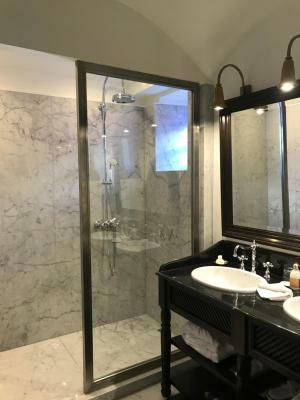 It includes a private bathroom fitted with shower and toilet. 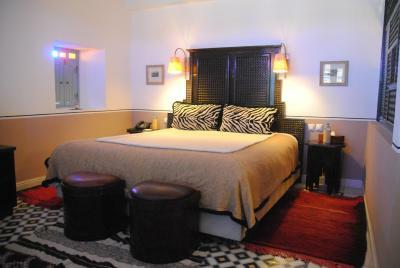 The Suite can accommodate 2 adults and a third person can be accommodated at an extra cost. 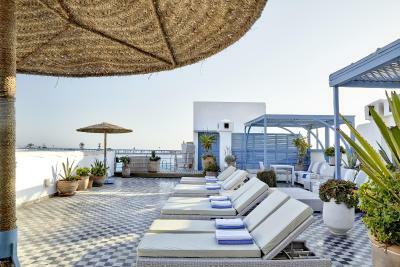 Premium suites are located on the second and third floors of the hotel and are accessible from the patio, featuring also a small communal terrace. A fireplace separates the living room from the bedroom. 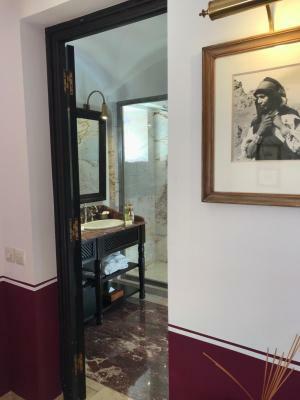 The suites are decorated in a warm African, English, Oriental depending on the case and have a king size bed and a bathroom with shower and bath and separate toilet. They feature a comfortable seating area and a desk. The equipment is complete with wardrobe, satellite TV, safe and mini-bar. 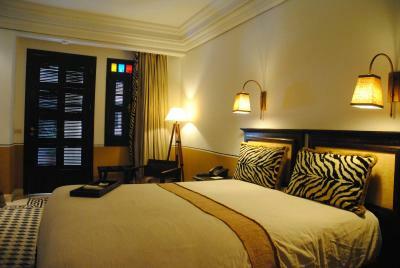 Consists of a deluxe suite and adjoining classic room, each with its own bathroom. 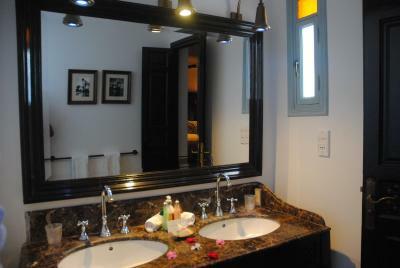 Decorated in an Oriental style, features a king-size bed and a bathroom with shower and bath and individual WC. Also includes a comfortable sitting area and a cozy corner office. A fireplace is located between the living room and bedroom area. 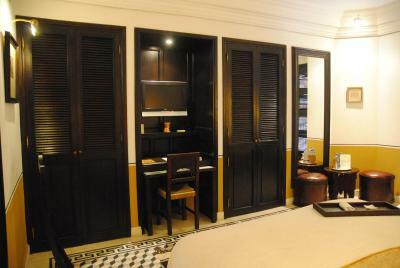 Facilities are complete with dressing table, satellite TV, safety deposit box and mini bar. 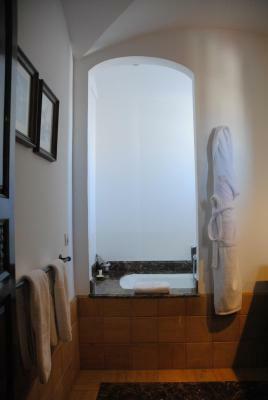 The Family Suites are located on the 2nd and 3rd floors of the hotel and are accessible from the hall of the central patio. 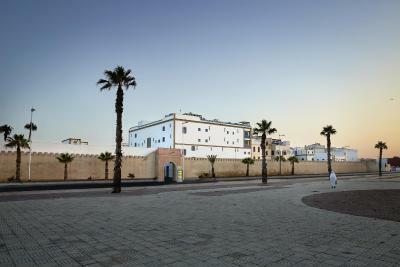 Overlooking the Atlantic Ocean, Essaouira’s old town or "Medina" is surrounded by an ancient city wall. 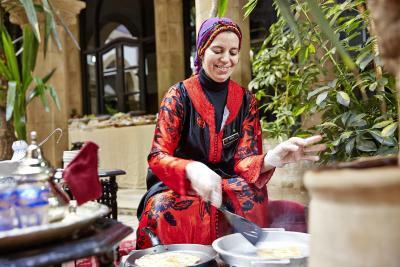 Browse the souks to see what they're selling before stopping at a cafe or bar. 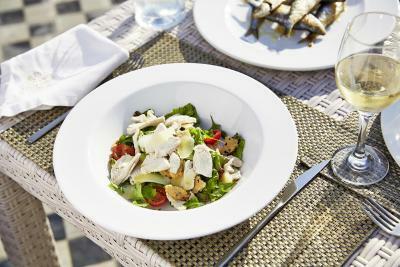 House Rules Heure Bleue Palais - Relais & Châteaux takes special requests – add in the next step! Heure Bleue Palais - Relais &amp; Châteaux accepts these cards and reserves the right to temporarily hold an amount prior to arrival. Heure Bleue Palais - Relais & Châteaux accepts these cards and reserves the right to temporarily hold an amount prior to arrival. Please note that for the Half-Board Formula guests can choose between Lunch and Ftour. Please inform Heure Bleue Palais - Relais & Châteaux of your expected arrival time in advance. You can use the Special Requests box when booking, or contact the property directly using the contact details in your confirmation. 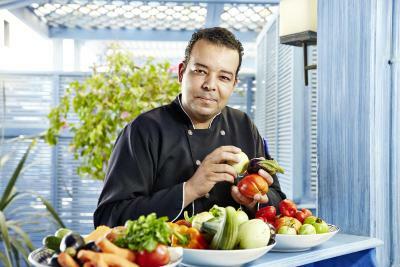 Eric and his great team make this place a little oasis in beautiful Essaouira! Pool could be a few degrees warmer. All rooms face inner courtyard which echos sound easily, so expect to hear noise from 8 AM onwards. Great breakfast, but they should leave the propane gas heaters out all the time in January as mornings are cold. 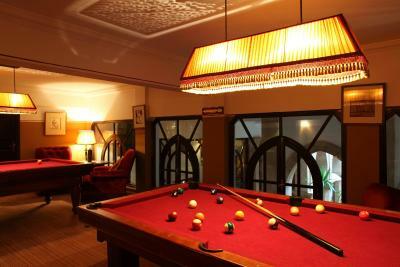 Pool room and cinema were fun. Had a wonderful and relaxing stay. The staff was extremely welcoming, provided great service and advice at any time. 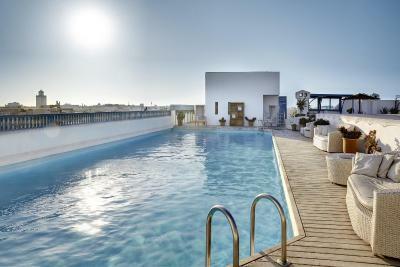 The rooftop and pool with view over the Essaouira and the beach are amazing. Wish we could have stayed a couple more days. We arrived at the hotel from the wrong side of the city walls, better instructions on arrival and where to park car would be useful as well as details of costs. Didn't like the airport style scanner immediately on arrival at the hotel, and nobody to greet you until you get to the front desk. Minibar a little sparse. Front desk didn't have stamps for sending post cards. Had to go to post office. Beds v comfy. Rooms well appointed. Bathrooms well equipped. Real fire on request was a nice touch. Sadly we didn't have time to try it, or the pool. 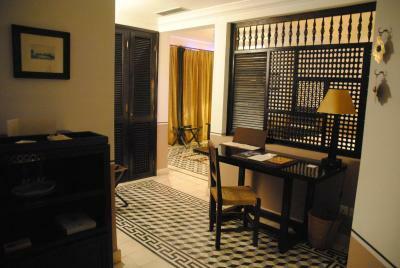 Property is worn and out of date, overall felt very dark inside vs. the bright, white feel of Essouira. The city is on the water so the hotel felt musty, not what you'd expect from Relais & Châteaux. Shower was hand held only. Breakfast service was inconsistent - offered eggs our last morning but not our first. Old fashion, needs renovation, doesn’t look like a True Relais & Chateau. However probably one of the best in town as there are not many options. 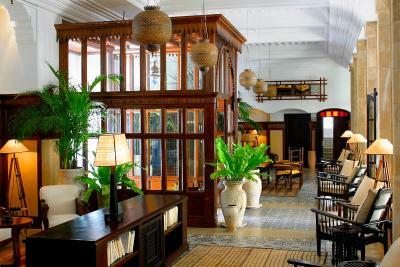 The colonial atmosphere made it magical, very well located next to the beach and Médina. 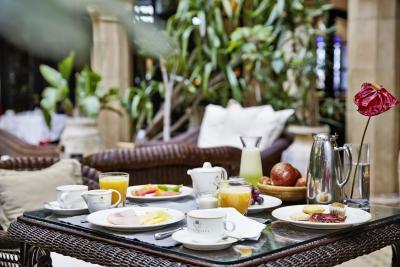 The quality of products for breakfast, the terrace with the swimming pool, the elegant and luxurious decoration and furniture, everything was perfect! Most beautiful place in Essaouira ! Single Beds small and extremely uncomfortable.